Is that a space age rocket silo sitting on your countertop? Evolved from Technivorm's original Thermal CDT model, the CDGT introduces a few upgrades to make your already delicious coffee even better. Changes include improvements to the filter basket, basket bracket, and a clean ridged finish to the side of the water tower. If you've only experienced coffee with the CDT before, now you'll be able to remove the carafe and see an automatic shut-off to your coffee flow. Made for ease of use and simplicity, the CDGT can be relied on to brew a deliciously hot pot of coffee, year after year. Mid-Brew Interrupt: The CDGT will automatically detect when the carafe is removed, and will temporarily stop its stream of coffee. However, this model does not come equipped with the capacity to make only a half pot! Click here to check out the KBT741 if that sounds like an option you would like to have. Even Extraction - Designed to evenly spread water over your coffee grounds for skillfully balanced flavors. This efficient brewing cycle is completed in five to six minutes. Durable and Replaceable Parts - Built with a copper boiler, backed by a five year warranty, and sold alongside easily replaceable parts so that your machine can be maintained for years to come. Thermal Carafe - Includes a thermal carafe that keeps the coffee fresh and hot. Indicator light shows when the carafe is in correct position to start brew cycle. Includes the brew through lid and the closed top travel lid. Gold Standard Coffee - Coffee tastes 'sooooo' much better when brewed at the correct temperature, and with the right equipment! With this level of attention to detail, you can taste the difference. Hot Hot Heat - One of the few coffee makers out there that will consistently brew at 200°F – a temperature certified by the SCAA (Specialty Coffee Association of America) to create premium flavors. Copper Boiler - Designed for optimal heat distribution inside the boiler, the use of a copper material boiler comes with the added bonus of increased durability and longevity for your machine. No Internal Clock - Many modern coffee machines come with internal clocks that will brew coffee for you in the morning - but often that also means having to leave your ground coffee out overnight! It may be less convenient to take these steps in the morning when you wake up, but the taste of your morning coffee will outshine the process. Space Age Design - Stylized with a vertical ridged pattern along the water tower to match the Techinvorm KM4 grinder. Some have noted that you might want to set this brewer up with an anchor to keep it in place, otherwise it could fly off into space! The Technivorm Moccamaster CDGT is most similar to Technivorm's newer model, the Moccamaster KBT741. 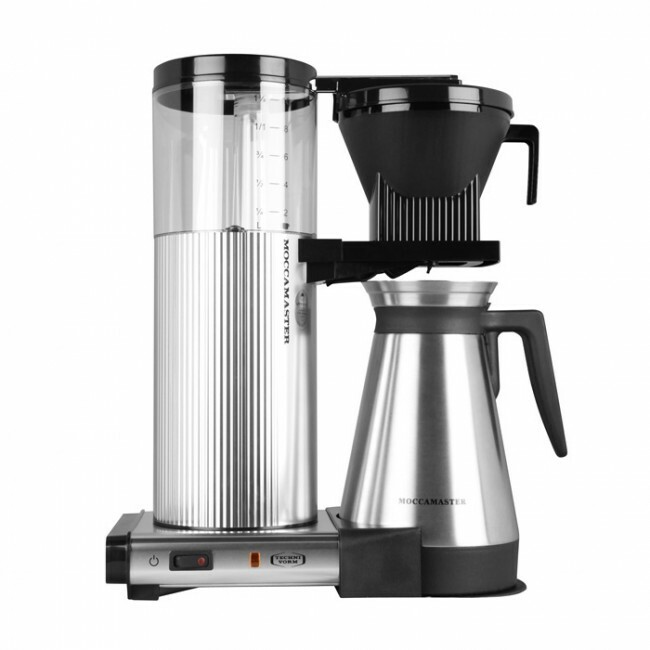 These two brewers feature uniquely styled exterior designs, and the KBT741 comes with the ability to brew half a pot at a time. Otherwise these two brewers are almost identical! Let us break it down for you: Although 8 ounces equals a cup in the baking world, a US cup of coffee is measured at 6 ounces and a European cup of coffee is measured at 4.25 ounces. This is why we sometimes list ounces to paint a more accurate picture of capacity. Water really does make a difference. Always use filtered water to make drip coffee taste better. Soap out the inside of the kettle and brew basket on a regular basis. Use Cleancaf if necessary to remove an coffee stains or residue.